Blockchain (a shared, immutable ledger for recording the history of transactions) first caught the world’s attention when it appeared as a platform for securely sharing cryptocurrencies like Bitcoin among anonymous users on public networks. Today, the technology is generating considerable interest across many industries — ranging from banking, finance, and insurance to healthcare, government, retail, and manufacturing. Organizations are now using blockchain to develop a new breed of transactional business applications designed to embed trust, transparency, efficiency, and accountability into the process of sharing and transferring a broad range of assets in a business network. Today’s blockchain applications are not limited to handling currencies. Assets ranging from equipment, warranties, and artwork to healthcare records and shipping data can now be shared, exchanged, or transferred via a blockchain network more efficiently, and with greater collaboration and less risk to stakeholders, than is customary using traditional practices. But what is the actual status of blockchain adoption within organizations today? And what are their plans for applying the technology in the near future? In what ways do they view blockchain as a potential disruptor to their industry? And, finally, what issues do they see as hampering their efforts to use blockchain technology? Receive your complimentary copy of the second article in this Cutter Consortium series when you fill out our special offer form. Discover how organizations like yours are budgeting for blockchain technology. Read It Now. To answer these and other key questions, Cutter Consortium has been conducting a survey to gain insight into how organizations are adopting — or planning to adopt — blockchain technology. We are also seeking to identify important issues organizations are encountering or foresee encountering in their blockchain efforts. In addition to gathering and analyzing the survey data, I have been conducting telephone interviews with leaders and practitioners from different organizations who are implementing or working to implement blockchain applications. Their opinions and recommendations on using the technology adds some depth and richness to the survey responses and will, we hope, contribute to blockchain decision making at your organization. The survey findings presented in this Update are the initial results from our (still-ongoing) survey and are based on the answers of 79 organizations worldwide of various sizes. I also draw from discussions with respondents whom I interviewed to gain additional insight about blockchain issues. Where applicable, anonymous quotes from these practitioners are included. Forty-two percent of responding organizations are headquartered in North America, 30% in Europe, 18% in Asia/Australia/Pacific, and 4% in Africa, with the remainder in India, the Middle East, and South America. Responding organizations’ annual revenues also vary, with 14% having annual revenues over US $50 billion, 11% between $10 billion and $50 billion, 17% between $1 billion and $10 billion, 11% between $100 million and $1 billion, 11% between $50 million and $100 million, and the remaining 36% having annual revenues under $50 million. Finally, Figure 1 expands on the general demographics, showing respondent organizations broken down by industry. We include this information to show that our findings are based on a sample of organizations located (i.e., headquartered) in various geographic regions, consisting of a broad range of small, medium-sized, and large companies with yearly revenues ranging from under US $50 million to over US $50 billion. The largest group of respondents hails from financial services companies; notably, however, the survey has also received input from organizations representing a range of industries as well as government and the military. Figure 1 — Respondent organizations by industry. The big question is, to what extent are organizations actually adopting, or planning to adopt, blockchain? As Figure 2 illustrates, fewer than 10% of surveyed organizations are currently implementing blockchain technology, while another 10% plan to implement blockchain within one year. At first these findings may seem somewhat underwhelming; however, other findings indicate that interest in blockchain is quite high, even though it is still a very new and emerging technology. This is apparent when factoring in the plans among organizations “seriously investigating the possibility of implementing blockchain technology.” Looking at it that way, we see that nearly 60% of organizations are either already implementing blockchain, planning to adopt it within the next 12 months, or are actively investigating the possibility of implementing the technology. On the negative side, 40% of organizations have no plans in the foreseeable future for using blockchain. Figure 2 — Is your organization currently implementing, or planning to implement, blockchain technology? I’ve been participating in blockchain seminars in Norway and have seen 600-700 people attending every time. And that’s a huge number of people (for Norway). What I like about the blockchain concept is that you remove insecurity and you establish trust where there is no trust in the beginning because you have a secure way of sharing your information, and you are certain it cannot be tampered with — at least not very easily. It is very difficult to change data in a block. You are almost 100% certain that it is what it is. That’s the idea of the ledger: that you have the transactions and that they are never changed. So you carry the “truth” with you all the time. Figure 3 provides more insight when it comes to surveyed organizations’ current stage of blockchain adoption. Summarizing, few organizations currently have blockchain applications deployed in actual production environments, and less than 10% are now developing prototype applications. The bottom line: most organizations “doing blockchain” are still experimenting with the technology (41%) to validate its potential (e.g., to develop a better understanding of blockchain functionality, to identify and evaluate use cases). Moving forward, and taking into account surveyed organizations’ future plans, we should begin to see an increase in the deployment of blockchain applications within the next 12-24 months. During this time, we should also expect to see an appreciable uptake in organizations building prototype applications as they move beyond the technology investigation stages. Figure 3 — To what extent is your organization currently using blockchain technology? One caveat is that almost 40% of respondents do not know to what extent their organizations are using blockchain. So there is definitely room for movement in our findings when we eventually finalize our results in the near future; however, I do not expect our final results to vary significantly from what we are reporting in this Update. Figure 4 — Has your organization established a dedicated group to support a blockchain initiative? Again, however, it is necessary to consider upcoming plans and efforts among organizations to gain a better understanding of what is going on when it comes to organizational plans for forming blockchain groups. Overall, 46% of surveyed organizations have either already established a dedicated blockchain group, are planning to create such a group within the next 12 months, or are actively investigating the possibility of forming a group dedicated to supporting their blockchain initiatives. That said, nearly as many participants have no plans in the foreseeable future to create a dedicated blockchain group. Who Is Taking the Lead on Blockchain? Figure 5 shows the groups or teams that appear to be taking the lead for adopting blockchain into the organization. The overwhelming trend is for IT or innovation groups to be responsible for bringing blockchain into the organization. These two groups far outstrip all others when it comes to leadership for blockchain adoption; indeed, nearly half of survey respondents report that these groups are primarily responsible for blockchain technology adoption, with R&D, business strategy, and digital transformation groups/teams trailing a very distant third, fourth, and fifth place, respectively. Other groups cited by survey organizations as leading their blockchain efforts include enterprise architecture, security, the registrar’s office (for universities), and their partners. Figure 5 — Who/what group is taking the lead on your organization’s blockchain initiative? A follow-up question asked why this particular group or team was chosen to take the lead on blockchain. In many cases (but not all), survey respondents claim that it was not so much that these particular groups were picked, it was more that they were the first to realize the potential for blockchain and thus took the initiative to explore the technology. Consequently, at least for these organizations, the blockchain effort is not being mandated from above. It’s quite logical that these groups — IT, innovation, R&D, business strategy, and digital transformation — are the groups initially in charge of blockchain since they are typically responsible for discovering and evaluating new technologies. But survey participants also believe that eventually the project will be handed off to the group or department responsible for where blockchain will eventually be applied in production (e.g., trading, supply chain, lending, Internet of Things [IoT], warranties). We’re trying to arrange things a bit different. We started with a small group of IT people and R&D, and we also have a special group for digitalization — and we are getting input from all of them. In addition, we have some communication with sales and marketing because, even though they are not technical, they see that their prospects and their clients are starting to discuss and ask about blockchain. So they want to participate. And I think this is a good idea because they [sales and marketing] might give us the right ideas on how to focus and how to get this [blockchain] started. I think it is very important in order to make sure the project is successful, if possible, that you have the market with you, because blockchain is all about communication and sharing information the fastest way possible. So you need to have your customers and stakeholders involved as well [in the project]. This is not an IT thing or some­thing you will do in your data center like we do currently with databases — today we have large data storage in the center of the company. Blockchain will not be in the center of anything — it will be distributed. Current blockchain implementation is low but interest in using it is quite high; expect an (eventual) high rate of adoption. Although fewer than 10% of surveyed organizations are currently implementing blockchain, about half are either planning to adopt blockchain within the next 12 months or are actively investigating the possibility of implementing the technology. Looking forward, we should expect a high rate of adoption — at the earliest, within two to three years; at the latest, within three to five years. Most surveyed organizations are still experimenting with blockchain to validate its potential. Blockchain applications deployed in actual production environments are rare. That said, we should expect both the development of prototype blockchain applications and the deployment of production blockchain applications to experience appreciable increases over the next 12-24 months. Most surveyed organizations have yet to establish dedicated blockchain groups. Organizations with established groups or teams dedicated to supporting their blockchain efforts are limited (i.e., less than 20%). That said, we should expect to see an appreciable increase in organizations forming dedicated blockchain groups over the next 12 months. Those wanting to remain in the forefront of blockchain adoption and development should, if they have not done so already, plan to establish a dedicated group within (at most) one year, or risk falling behind. The current trend has IT or the innovation team taking the lead on adopting blockchain into the enterprise. Nearly 50% of organizations indicate that these two groups are primarily responsible for blockchain technology adoption, with R&D, business strategy, and digital transformation groups trailing considerably behind. For many organizations, blockchain adoption is not currently mandated from above. For these organizations, the group(s) taking the lead on adopting blockchain were not so much picked or assigned, but rather were the ones showing an initial interest in the potential of applying the technology and thus took the initiative for evaluating and experimenting with it on their own. Some organizations are assigning specific groups to lead their blockchain initiatives from the top. These organizations, often financial services firms, tend to be further along in their blockchain efforts, with upper management assigning a specific group(s) to lead their blockchain efforts because they are best positioned to ensure successful evaluation and adoption of the technology and its integration into the respective IT and business areas. A hybrid approach is important for blockchain. Practitioners at organizations implementing blockchain repeatedly stress the necessity of involving multiple groups — from both the technical and business side as well as partners and other stakeholders — in any blockchain strategy to help ensure a successful project outcome. 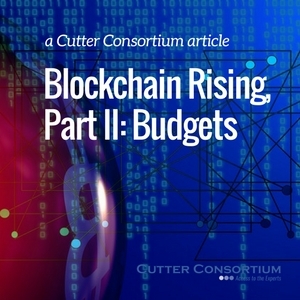 Part II of this Update series focuses on survey findings pertaining to budgets for blockchain in the enterprise and the benefits organizations hope to achieve with their blockchain initiatives. We will also examine the main issues hindering efforts.